This may be as far as I got last year. I don’t remember and don’t intend to remember because I’d rather save the brain space for where I last left my phone. I chose the “Stuff I use Daily” drawer in the kitchen. It has no real category other than that. It holds odds and ends that I use daily or even 2 or 3 times a week. At least, that’s what it’s supposed to hold. 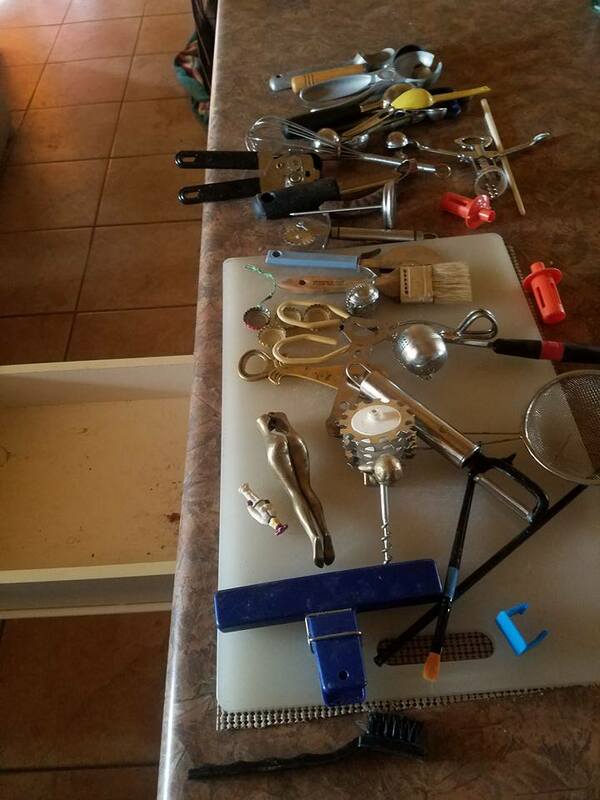 That’s where things like measuring spoons, whisks, bottle openers, ice cream scoop, jar openers, a butter brush, and such are supposed to go. That’s not all that was in there. I forgot to get a “Before” picture, but this is the big stuff that was in there. I had cleared out the ancient packets of yeast and soy sauce, the rubber bands, the loose change, and a handful of petrified jelly beans and other gleefus, and had narrowed it down to the stuff I actually use daily, weekly, a lot less than once a week, and never. 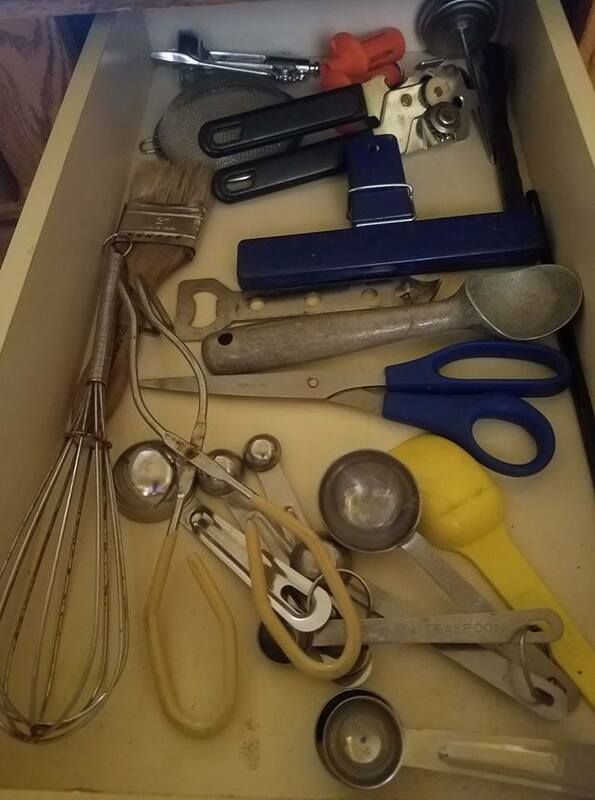 No wonder my whisks wouldn’t fit and I could never find my measuring spoons. WHO needs 4 ice cream scoops? Only 1 survived the purge. The survivor did not have a nice hand fitting handle, nor did it mechanically loosen ice cream from the scoop. No, it was old faithful. 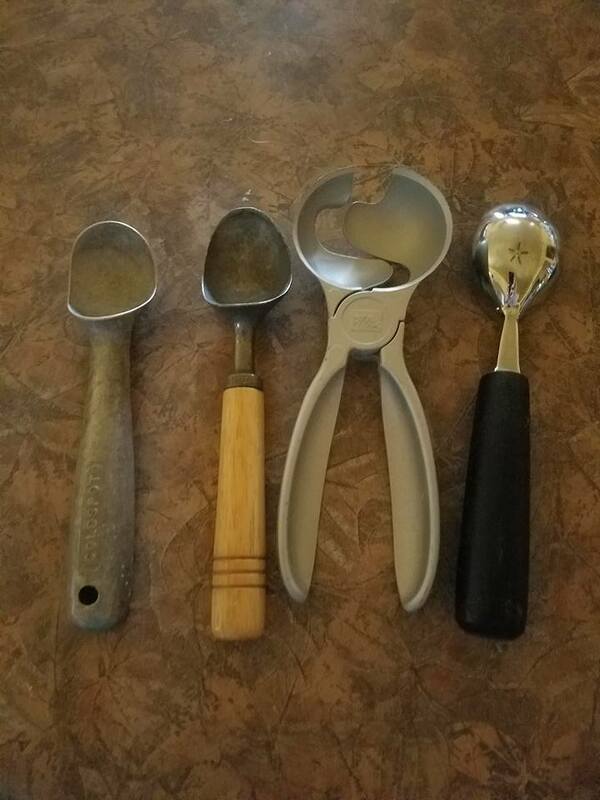 40 year old, solid metal, no bells, no whistles, ice cream scoop. Easy to use, takes a sledge hammer to break. Then there were these. I think we’ve used the corkscrew a half dozen times since it was given to us in 1995. 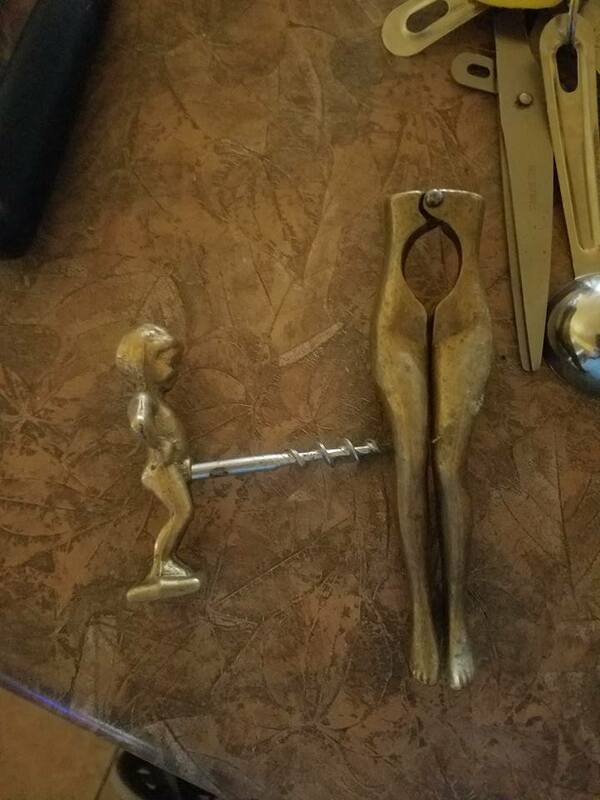 I don’t think we’ve ever used the nutcracker we got at the same time. My husband’s grandmother gave them to us the first year we were together. I laugh raucously every time I see them, so they’re keepers. I just have to find another place to keep them so they can continue to appear and make me guffaw when I’m looking for something else. No, I did not find dachshund or cat poop in my “Stuff I use daily” drawer. This is some kind of seed pod. 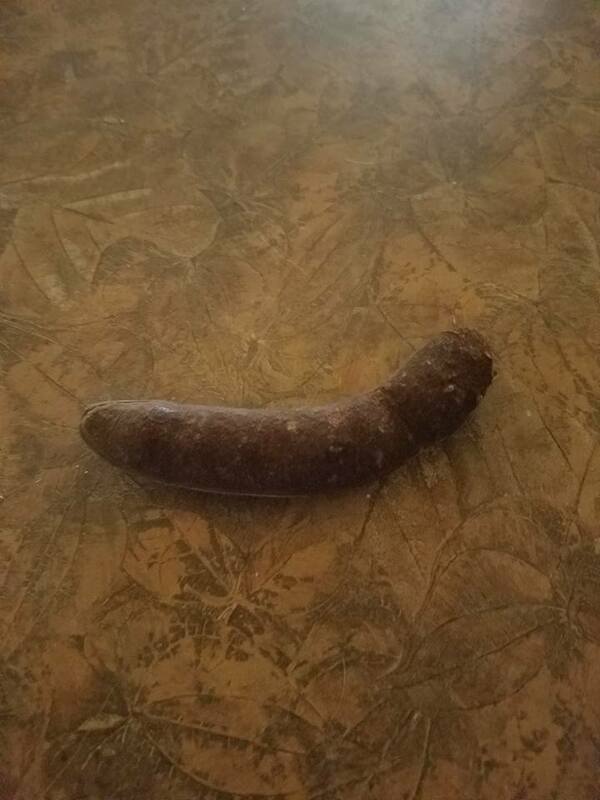 I have no clue what kind of seed pod, and I have no clue why it’s in this drawer, but it’s been in there for several years because I keep saying “I need to plant that and see what grows”, and then don’t. Last year’s January Cure didn’t go so well for me. I did something to my good knee early on and as it was only getting worse, I put myself to the sofa with the mutts and Netflix. That knee is no better now and the knee on the already goofed up leg is failing because it’s had to do too much to make up for the other knee. I won’t discuss other skeletal failings at this point, suffice to say I need an android body. Another issue that will hamper my Cure this year is Art. It’s insidious. It slyly creeps into your life as an innocent and fulfilling hobby and then spreads like herpes. A friend got me interested in acrylic pour painting. It is very cool and very rewarding and makes watching paint dry actually exciting. It’s also a good way to participate in art for someone like me who cannot draw, much less paint. 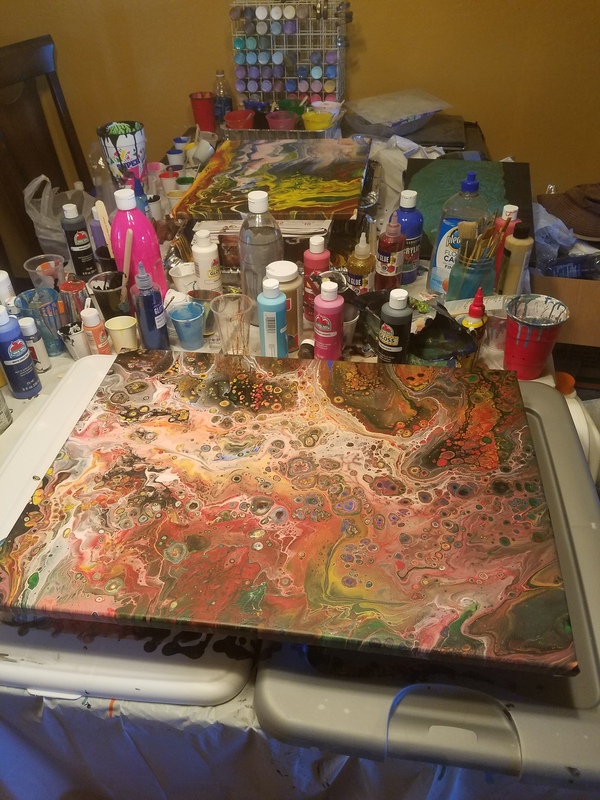 What acrylic pour painting requires are, a sense of color and space. Lots and lots of space. Overheard in this house at the beginning, “Do we ever actually eat at the dining table? Okay, let’s do this there.” I’m no longer sure we have a dining table. We must, all those paint bottles, cups, popsicle sticks, jars, jugs, canvases and stuff can’t be floating on air. I just can’t see the dining table. 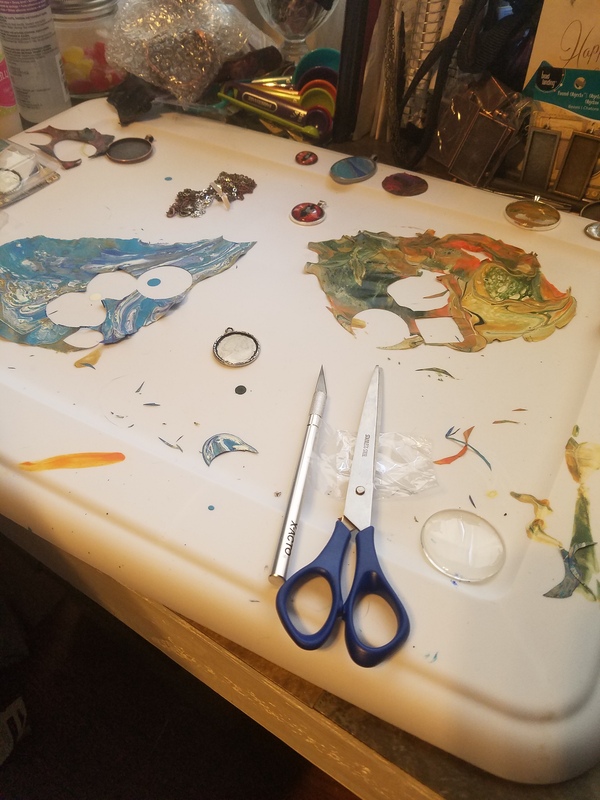 There’s a big mess to be made with acrylic pour painting. As the name implies, you pour paint. When you pour, there is inevitably runoff. Turns out, when this runoff dries, it too makes interesting and colorful patterns that can be peeled up, cut out and turned into really groovy pendants. No room on the table for that. 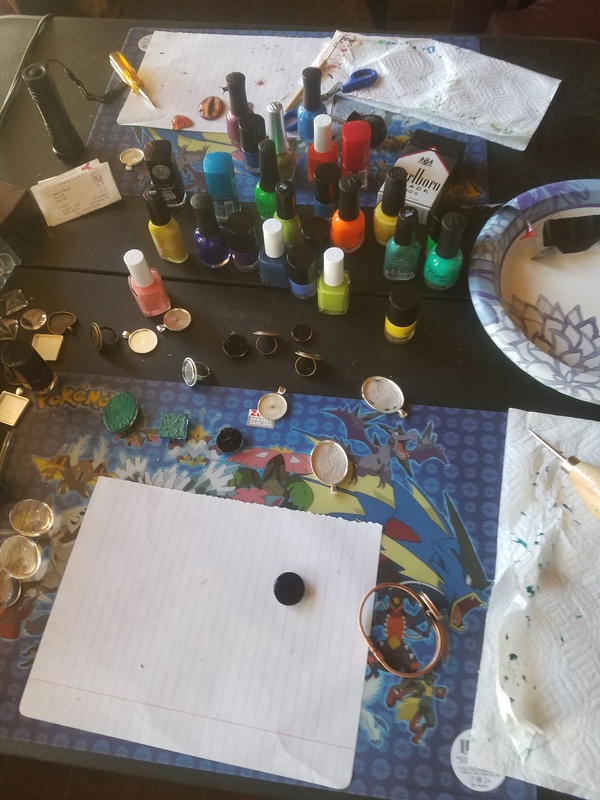 Had to set up a jewelry making station in the actual craft room. That was art station 2. I posted a picture of a couple of pendants I made and was asked “Do you sell those?” and answered “I guess I could”, which prompted “Can you do one in these colors <insert wild combos here>?” and I answered “I could try.”, which led to art stations 3 and 4, an Etsy shop and 12 hours a day prior to Christmas trying to balance art and rest for my busted up body. So, there’s art all over the dining table, 3/4 of the craft room desk my son and I built along two walls, a card table in the craft room and a card table in the den. 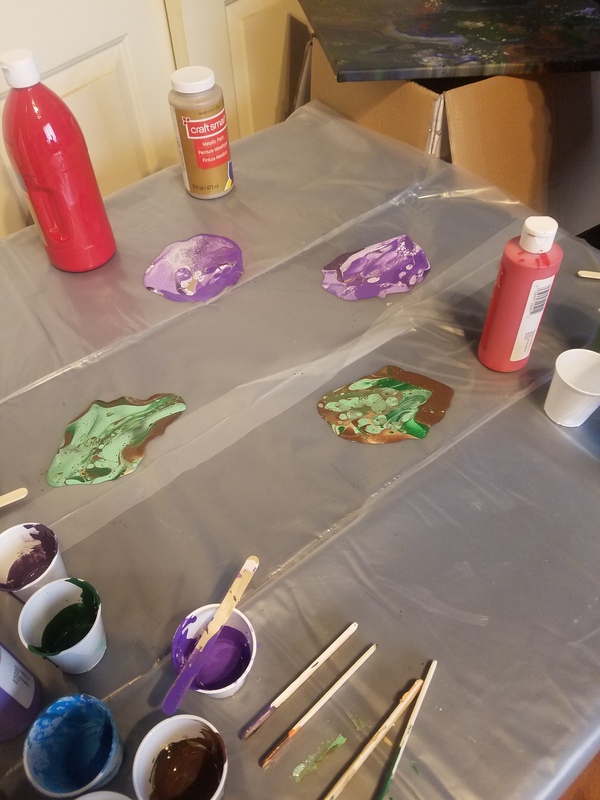 We have renamed the house “The Mad Artists Laboratory” and our Etsy shop is named after the friend who started us down this road (probably rubbing her hands and cackling maniacally), my son (who also got sucked in) and me, JJaphne. If you’d like to see (and dear lord I hope you buy, because I need to reclaim some space and pay my Home Owners Insurance and Property Taxes) our stuff, the Etsy shop is here: JJaphne Jewelry and Art. So, this year I have to have a different relationship with The Cure. Large projects will have to be done during the week on my son’s days off, and might not get done at all. The smaller “Jean Safe” tasks will be accomplished on weekends and on three days during the week which may or may not coincide with The Cure Calendar. That’s enough for the rationalizations. On to the first real assignment to clear out and organize a drawer in the next post.